Your business needs the right mix of cost effectiveness and superior grade performance in app and web development. This not only helps you in your online customer acquisition strategy but also allows you to remain sustainable through budget-friendly development work. With GoodWorkLabs by your side you get the perfect blend of competent PHP programming that results in tremendous visibility boost to your business online. All this without the exorbitant overheads of license procurement and maintenance because of the open source platform employed by PHP. GoodWorkLabs’ dual presence in Bangalore, India and San Francisco, USA gives us a competitive edge when driving all-round customer servicing. While we utilise some of the finest minds in PHP development through the India hub, we remain present in San Francisco for better client engagement for our North American client base. This unique blend allows us to add true value to our servicing abilities when we get down to driving first-rate PHP development for our global clientele. With a wealth of experience in creating PHP applications across a wide range of complexities, our team of best PHP developers and experts are your ideal business growth drivers. We practice Agile Software Development methods such as Scrum and Extreme Programming, and love contributing to open source projects. The benefits of using PHP development technology stack includes lower costs with rapid development, and excellent support from open source communities with tons of gems and plugins available. 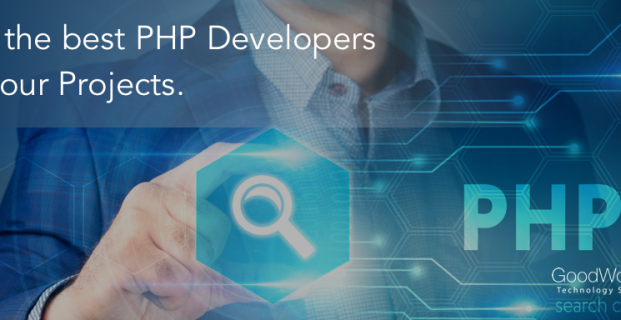 With hands-on experience on scores of PHP based projects over the last many years, our team can help you craft out an amazing user experience with your intended audience. With core focus on enhanced UI/UX experience, user profiles, design flows and user stories, our team in Bangalore follows pair programming methodology, along with continuous integration (using tools like Cruise Control), TDD (test driven development) among other extreme programming (XP) paradigms. • PHP Custom application & software development. • PHP Technical Support and maintenance. GoodWorkLabs can capably handle end-to-end PHP development activities, including requirement gathering, solution construct, architecture, design, development, testing, deployment and even your go-to market strategy. In case you need to append PHP expertise to your office location or working remotely, then we can ensure that this happens with zero hassles and with great productivity that is targeted exclusively for your business. Want to rapidly develop a rich PHP based web application? Request a FREE quote today!